If you want to promote your business to local people in one or more of our magazines, our next edition is February/March 2018. Do get in touch by Monday 15 January at the very latest, to see how we can help. You can call Tina on 07952 591031 or drop her an email tina@allabout-local.com. Any story request, events and group details can be emailed to james@allabout-local.com. 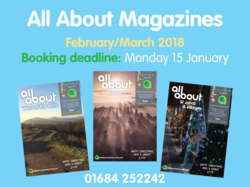 Alternatively you can give the office a ring on 01684 252242 or you can visit one of our websites: www.allaboutmalvernhills.com & www.allaboutworcester.com – you will be able to read through our current magazines to see what they look like and if it is something for you. You can download our media pack here.